If you’re planning on moving to a smaller apartment, it’s inevitable – you’re going to have to get rid of some things. Downsizing has its benefits – less space to clean… less rent to pay. However, downsizing to a smaller apartment comes with a unique set of challenges. Are you trying to save money on your monthly rent? Are you testing yourself to see if you can live a more minimalist lifestyle? Whatever your reason for moving is, there will be work to do. 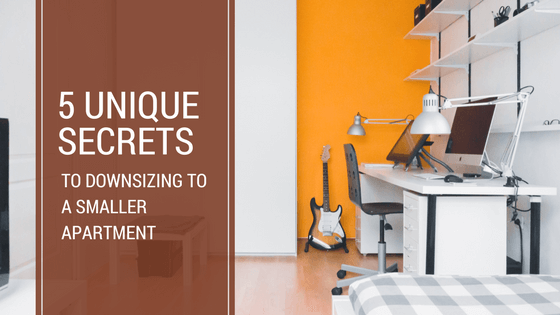 Before you make your move, check out these 5 unique secrets to downsizing to a smaller apartment. If you really want to know how to downsize your belongings you have to take inventory of what you already own. Downsizing to a studio apartment or a one bedroom apartment won’t be difficult at all – as long as you’re ready to part with some things. Start by taking inventory of every item in your current apartment. Once you take stock of what you have you’ll be able to decide what you need to take with you. Go room by room to identify the items that mean the most to you. Once you know what you will be taking on the move you can sort the rest as trash or donations. Do you have four sets of dishes in your kitchen cupboards? Keep one for everyday use and keep one set for special occasions – donate the other two to charity. Are you overloaded with trinkets that have become dust collectors? Keep the ones that have special meaning and get rid of the rest. Are there clothes in your closet you haven’t worn in five years? Keep what fits or still appeals to your sense of style and toss the rest into a bag for donation. Downsizing to a studio apartment or a smaller space will be less stressful if you only take what you need. Don’t kid yourself into thinking that you’ll take everything then sort it out when you get there. Do yourself a favor and do the hard work before you move. That way, you might actually have some space to buy a few new things that you need. Moving can be expensive, so any chance you have to make a few extra bucks can be crucial at this point in time. If you were moving to a bigger place you’d need to spend time and money to fill it up. But since you’re downsizing, take this opportunity to rid yourself of unwanted extras. Take a hard look at your possessions – item by item – and think about the items that others may be able to use. If something is worth selling, list it online as a way to make a few extra dollars. Have things that aren’t worth much but are still in usable, working condition? Add these to your donation pile. Remember, your trash may just become someone else’s treasure. If you’re moving from a large space to a small one, you’ll need to get creative about storage. You can maximize space in a small area by utilizing furniture that doubles as storage. Pieces that do double duty, such as storage ottomans, will help to eliminate clutter. They’ll also save you from busting your budget at Bed Bath & Beyond or The Container Store. If you find that you do need specific storage items, figure out what you need before you go shopping. Items built strictly for organizational purposes are perfect for small spaces. Look for shelving units and cabinets from Ikea or Crate & Barrel that offer function and style. There’s a reason that people say “less is more.” Downsizing offers a simplified way of living – but it also creates an opportunity for a fresh new start. Living in a minimalistic environment can help you to feel more at ease and more relaxed. With fewer items clogging your space (and brain) you’ll be able to focus on what’s truly important. Once you’ve grown accustomed to having less space, don’t allow yourself the option to fill it with more things. Think about the hard work you did to clean out your old place, and promise yourself you’ll never have to do that again. Create a weekly routine and cleaning schedule that encourages a clutter-free home. Set aside some time every weekend to throw away junk mail, toss leftovers from the fridge, and clean. Dust your cabinets. Clear off the coffee table. Make sure your recent Amazon purchases aren’t stacking up at the door. Give everything a place and keep everything in the place you’ve designated for it. This is the easiest and best way to keep clutter at bay. Once you’re in your new apartment, the hardest part is behind you. Keep clutter to a minimum and you can make your home the clean, stress-free environment you want it to be. When you’re ready to simplify your life, create a downsizing home checklist. Go room by room and make a list of what you need to keep. Create piles of what you can donate and what you can toss. By keeping only what you’ll need, you’ll have less to move. Once you’ve moved you’ll have that much less to keep up with. Living a minimalist life can be absolutely freeing. Minimize clutter and your new, smaller space will be cleaner and more livable. With less to dust, less to shuffle through, and less rent to pay, get ready…you’re on your way to living a much better life! Check back to our Las Vegas property management blog soon for even more great tips on the home, property and rental investments!